It’s so easy to prep and clean!!! 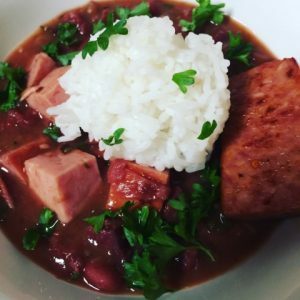 I decided that my first meal that I would prepare in an instant pot would be red beans and rice because it usually takes me over 4 hours on the stove and 8 hours in a crockpot. And to be honest…with this weather in Louisiana…this momma is not standing in front of no stove for 2 hours much less 4!! When making Red Beans and Rice you can used any type of meats that you want. 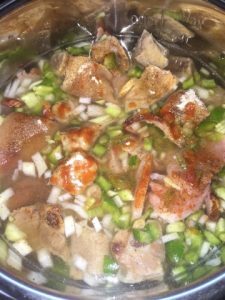 There are times that I would use thick chunks of pork belly with pickle pork and sausages…you can use ham hock, pig feet, pig tail etc…just depending on your preferences. When I used the Instant Pot …I didn’t have to soak my beans…I just pour them straight into the instant pot and cooked it. This is the INSTANT POT that I have…but they have a smaller version…. here. This one has a yogurt function. Depending on how big your family is and what functions you are looking for..they have so many to choose from. I have to say that its one of the best kitchen appliance that I have. 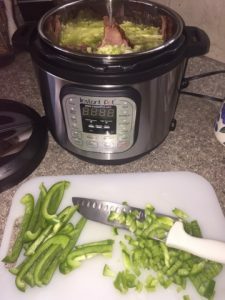 When I was doing my house renovation and living in a small area of my house…I used my instant pot for every MEAL!! It saved us from having to go eat out every single day. ****CHEATING METHOD: 1 small can of blue runner red beans (I pour that in after everything is cook and when I am mushing the red beans against the side of the pot. I find it makes my red beans creamy….this is strictly OPTIONAL. In a little pot I filled it up with water and place my cut spareribs and pig feet in and blanch over to get all the gunk out. Once the pot start boiling I blanch through. Next, I wash it with just regular tap water and then I place it on top of the red beans that is already in the instant pot. Next, I lay all my veggies (chopped onions, bell peppers, garlic, and celery) in top. Cover with just enough water to cover everything. Then, I ADD all my seasoning on top. Don’t forget the BAY leaf. Close the lid and turn on to the “beans/chilli” setting but I adjust the time to 1 hour. 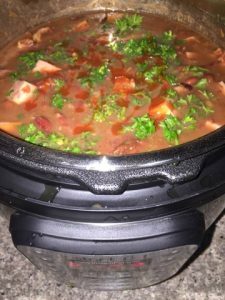 I do a QUICK RELEASE and add in 1 small can of blue runner red beans into my pot. Taking a small spoon or ladle…I smooch the beans against the pot to make it more creamy. Then I add 1 stick of unsalted butter into the pot. Serve over white rice and garnish with some chopped parsley and green onions. Season according to taste. 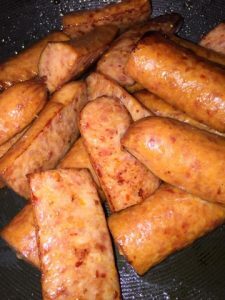 I used a pickle pork so I didn’t need to add that much salt or Tony Chacheres.